Dan and Jeff star in their fourth family comedy adventure, compressing all 60 Sherlock Holmes stories into 80 frenetic minutes of stage time! 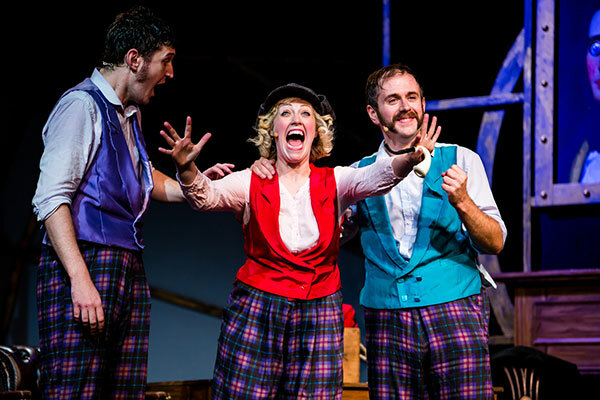 Following Edinburgh premiere in 2014, a successful West End season in 2015, and a US tour in 2016, the show is available for touring internationally. Written and Daniel Clarkson and Tom Clarkson, Directed by Hanna Berrigan, Set by Simon Scullion, Costume and Props by Louie Whitemore, Lighting by Tim Mascall, Sound by Tom Lishman, Music by Phil Innes. Edinburgh & London productions featured Daniel Clarkson, Jefferson Turner and Lizzie Wort (pictured below). US tour production featured Daniel Clarkson, Natalie Scheetz and Jefferson Turner. For over 100 years, Sherlock Holmes has been entertaining readers with his fierce intelligence, interesting caseload and slightly maverick approach. So anyone attempting to encapsulate all 60 of Arthur Conan Doyle’s Holmes tales (the four biggies, plus lots of short stories) had better have a healthy dose of those qualities, themselves. 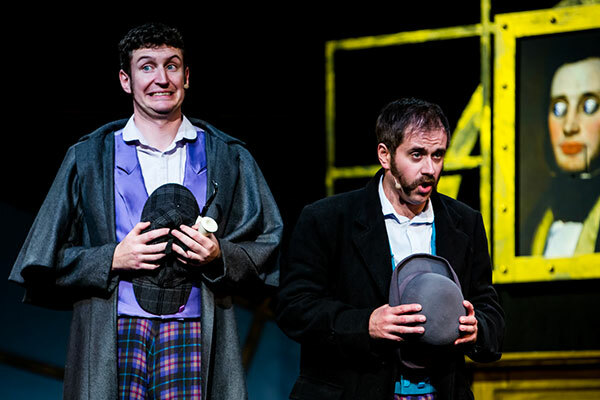 Fans of Dan and Jeff’s previous Fringe shows, Potted Potter, Potted Pirates and Potted Panto will know that the duo is indeed armed with a sharp wit and ability to approach things from an unexpected angle – so Potted Sherlock is in safe hands. Re-counting 60 tales in 70 minutes would, you’d assume, be impossible. Especially given that a good half hour of that time is spent on absolute silliness that makes no reference to the actual stories at all. But that’s where the genius lies. An endless round of cases explained and solved would quickly tire – whereas Dan and Jeff’s between story banter never grows stale. A fairly elaborate set places us in Baker Street, while a range of ridiculous costumes (hats in particular) illustrates the countless clients and combatants Holmes and Watson encounter during the stories. Which would probably stretch beyond the physical capacity even of these two, were it not for the welcome addition of a new female cast member. With more entrances and exits than a French farce, the trio hurtle around the set and through the Holmes back catalogue, pausing only to give extra attention to A Study in Scarlet, The Sign of the Four, The Hound of the Baskervilles and The Valley of Fear. Cultural references come thick and fast – some for the adults, some for the kids, most for all – and, like Sherlock Holmes himself, cleverness and wit triumphs over a seemingly impossible task. In this new show Dan and Jeff turn their attention to the entire canon of Sherlock Holmes stories (there are 60, don’t you know, if you count all the short ones as well as the long ones…?) and although it doesn’t seem like the most obvious author to ‘pot’ when there are kids in the audience, they do succeed amazingly well at creating a performance that is hilarious and accessible for all. The day we attended the audience seemed to comprise far more adults than children though, and it seemed fitting, because so many of the jokes and references fly above the heads of the average small child. It’s not a problem though, because the slapstick and silliness appeal to everyone, regardless of age. Dan Clarkson and Jeff Turner bring their fourth Potted stories to the Fringe. 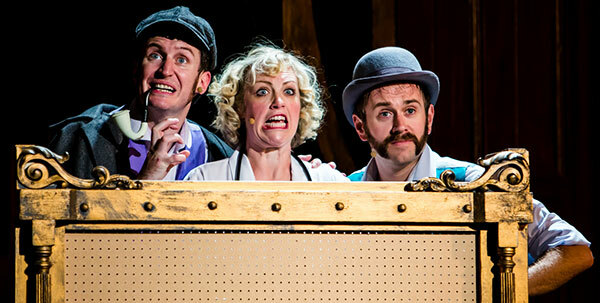 It follows their highly successful Potted Potter, Potted Panto and Potted Pirate shows. This time they turn their attention to Sherlock Holmes with Potted Sherlock. It follows the same magical formula as the others but this time the comic duo have the addition of a woman whose name they can’t remember. She is in fact Lizzie Wort and enters into this madcap world of comic mayhem with enthusiastic relish. This is a 70-minute chaotic romp through all 56 short stories and 4 novels so is quite a challenge. It works perfectly with wonderfully funny sketches, tremendous physicality and is filled with terrible puns and gags that the audience loved. There is some great visual comedy and the action is fast paced and hilarious particularly when things apparently go wrong. The telling of the Hound of the Baskervilles complete with sound effects is certainly a highlight. The sequence when they change characters by putting on a different hat when a buzzer sounds is hilarious and exhausting to watch. It’s a witty script with Sherlock completing everyone sentences and getting his many catchphrases wrong. The ongoing emergence of Moriarty as a puppet is hilarious and he makes many false appearances but I wont spoil the funny gags. What is delightful about this show is the warmth and rapport that Dan and Jeff build up with the audience with many farcical ad-libs. The slapstick humour gets bigger and this year is wetter. It ends with all 21 cases being solved in a song. This is great family entertainment. While they may have given themselves quite a challenge in trying to boil down 60 complex mysteries for an audience six years and up, there’s not a dull moment in the show. While the frantic pace does rule out much meaningful audience interaction, there’s a lot of good stuff to keep kids entertained, especially a unique take on the battle with Moriarty at the Reichenbach Falls. Dan Clarkson’s surreal wit remains front and centre too, allowing for the pace to maintained by the unexpected appearance of giant bees and killer snakes. 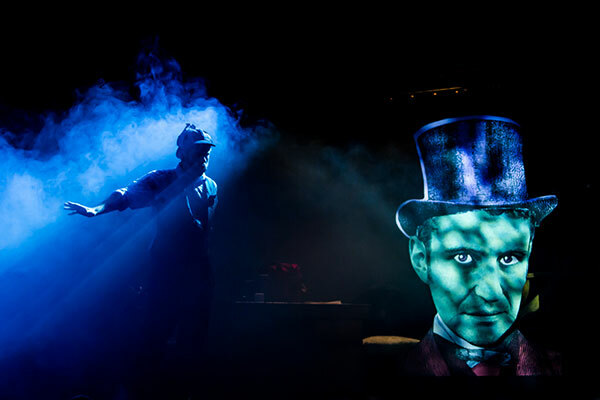 It might not serve as a primer on Conan Doyle and it may not have the advantage of the Potter captive audience but Potted Sherlock is still a cracking show for kids and grown-ups alike.